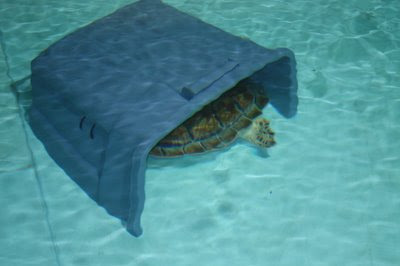 In previous posts I noted that we provide our sea turtles in rehabilitation some cool environmental enrichment. Goose, the green sea turtle, continues to enjoy his daily snacking of a lettuce forest. Some new enrichment projects were created in order to promote additional behaviors that we would typically see with sea turtles in the wild. Connie and Kate came back from their road trip to Georgia with some great new ideas from the South Carolina Aquarium. We placed a 4 inch diameter piece of PVC pipe in each of the turtle tanks for them to stick their heads in so that they can find some darkness for napping no matter what time of day. I already caught Casper and Iceman, Kemp's ridley turtles, poking their heads in to see what was inside. I also found Iceman resting with one flipper snuggling the pipe. We also made little caves for the turtles to hide in. We cut Rubbermaid containers in half and weighted them down to keep them on the bottom. So far Goose is enjoying the new experience of having it in his tank. He has been rubbing against the outside as well as the inside! The other turtles are still getting used to the new addition to their tanks. Iceman cautiously checks it out every once in a while. Two of our other Kemp's ridley turtles, Bubba and Dash, seem to enjoy spending their time swimming against the tank system outflow (remember Route's physical therapy? ), rather than hide in their new cave. At least they'll have a great sleeping spot when they need some rest!